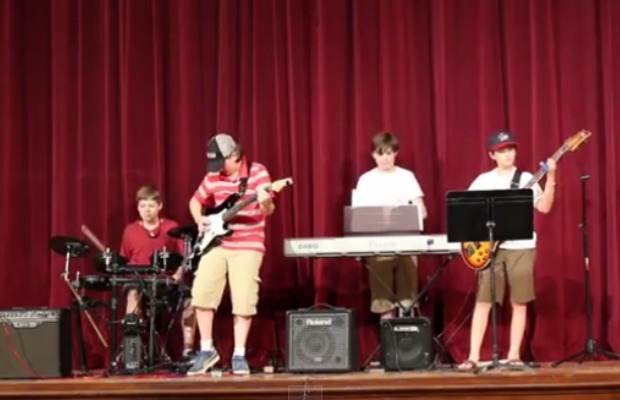 This pint-sized four-piece took a shot at covering Weezer’s 1994 hit, “Undone – The Sweater Song.” But about 30 seconds into their cover (after a pretty good start! ), it all goes terribly wrong due to an equipment malfunction. It all turns pretty emo, as the young singer freezes and just accepts defeat. It was very nice of the audience to still clap at the end. Nice try, guys. Check it out below, and let us know what you think. If you missed it, watch Weezer’s drummer Patrick Wilson catch a rogue Frisbee mid-performance.